Great for jacket pockets. 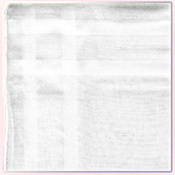 100% Hand-rolled cotton handkerchiefs are durable and resilient. They come in size 18 in. X 18 in white. 18 in. X 18 in., 18 in. X 18 in.